Our president Terry and two friends at Lansing JazzFest. Photo by GrandJazzFest. 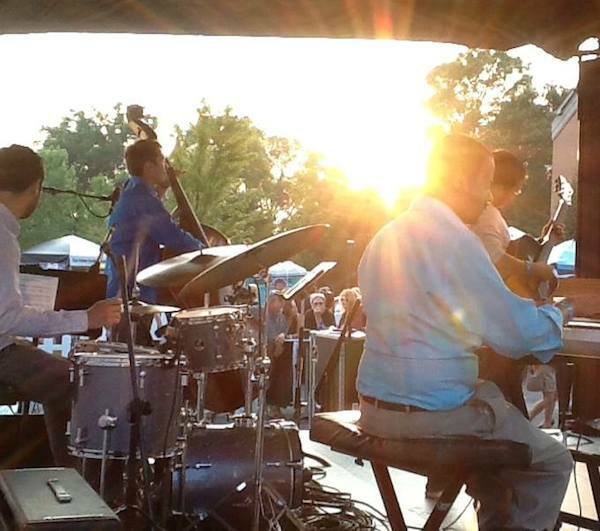 Lansing JazzFest celebrated its 20th anniversary on August 4th in Old Town Lansing. After a crazy hailstorm in the late afternoon, JazzFest welcomed the sunset and an audience of over 10,000 people with live music, local food, and delicious beverages. This year’s free two-day event featured performers including Glenn Brown & Intergalactic Spiral, Randy Gelispie Quartet with special guest Fareed Haque, RYZ featuring Perry Hughes and Gerard Gibbs along with many, many more. Jazz lovers from all over strolled the streets, swaying to the music and smiling. Our president Terry Terry was one of the founders of the very first Lansing JazzFest back in 1995. Since then, MessageMakers has been one of the largest sponsors, and we’re proud to support an event that contributes to the revitalization of Old Town. Every year, staff at MessageMakers work closely with MICA, producer of the JazzFest, to prepare for the festivals. Our role is to provide high quality production support, equipment, and publicity for the JazzFest. This year, many of our staff members volunteered their time and expertise to help with the festival. MessageMakers hosted the Green Room as a relaxation spot for the musicians, as well as a private party at the Studio in our building to welcome our clients and friends. Artists performed at sunset. Photo by Lansing JazzFest.